Here's my Press Release for Paint Canada Pink Week! 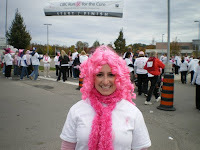 YORK REGION -- Are you ready to Paint Canada Pink? June 25th to July 2nd is Paint Canada Pink Week and marks 100 days until the Canadian Breast Cancer Foundation CIBC Run for the Cure! In your community and across Canada, families, friends, and co-workers will be Painting Canada Pink to support creating a future without breast cancer. We are challenging you to be creative about what YOU can do help PAINT CANADA PINK and get others talking about and fundraising for the Run for the Cure. Sunday, June 26: Pink Your Pup! We will be set up at the Richmond Hill K-9 Club Pooch Party at Richmond Green Park, Richmond Hill, with pink pup gear on hand! Register on site! Your dog can join you on Run Day! Monday, June 27: Pink Playday at Highgate Public School, Markham. Primary students will be creating a mural, which will be donated to the Canadian Breast Cancer Foundation CIBC Run for the Cure, York Region. Tuesday, June 28: Pinking up ESM! Canadian Breast Cancer Foundation CIBC Run for the Cure volunteers will be at East Side Mario’s in Aurora taking questions and live registrations. Thursday, June 30: Pink Produce? Catch our committee members at the Woodbridge Village Farmer’s Market from 3:30-7:30 p.m. The Woodbridge Village Farmer’s Market is located in the parking lot at Woodbridge Memorial Arena (Islington Avenue/Hwy 7). Friday, July 1: Happy (Pink) Canada Day! Our committee members will be on hand through the Canada Day festivities at Richmond Green Park, ready to answer any questions, and hand out pink goodies! Also take advantage of the day and register live for the Canadian Breast Cancer Foundation CIBC Run for the Cure! All Week: Merchants through the Village of Richmond Hill will spread the PINK LOVE by decorating their store/restaurant fronts, PLUS, East Side Mario’s Aurora will also decorate their restaurant pink for the entire week, with servers and staff dressed in pink. We invite all local media to capture Pink Canada Pink happenings in the community. The Canadian Breast Cancer Foundation CIBC Run for the Cure - York Region takes place at Richmond Green Park on October 2, 2011. In 2010, more than 2000 community members participated in the 2nd annual event, raising nearly $600,000 for breast cancer research. The Canadian Breast Cancer Foundation is the leading national volunteer-based organization in Canada dedicated to creating a future without breast cancer. Our fundraising – through our annual Canadian Breast Cancer Foundation CIBC Run for the Cure, special events, corporate sponsorship and donations – has enabled the Foundation to allocate millions of dollars in grants for breast cancer projects and services since our inception in 1986.